Vantawng Falls is beautiful two-tiered waterfall near to Thenzawl in Serchhip district of Mizoram state, India. Vantawng Falls is known as “Vantawng Khawhthla” in the local Mizo language. The height of Vantawng Falls is 229 meters or 751 feet and is the thirteenth highest fall in India. Vantawng Falls is situated deep inside the forest and hence it is very difficult to get close to the falls. The State Tourism department of Mizoram state has constructed a watch tower for the tourists to see the beauty of this magnificent falls. How do I go to Vantawng Falls? 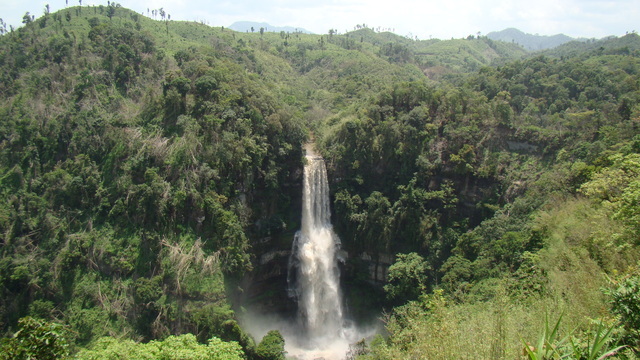 Vantawng Falls is at a distance of around 5 kilo meters from Thenzawl town. The district head quarters, Serchhip, is at a distance of around 40 kilo meters from the waterfalls at Vantawng. Aizawl, the capital city of the state of Mizoram is at around 137kms from the falls. Lengpui Airport, which is situated close to Aizawl city, is the nearest airport to the Vantawng Falls. There are regular helicopter services between Aizawl and Serchhip. “Bairabi” in Kolasib district is the only rail-head in the state of Mizoram and hence called “the rail-head of Mizoram”. Bairabi is situated at a distance of 130 kilometers from the capital city of Aizawl. National Highways 54, National Highways 40 and National Highways 150 connects Aizawl city with the rest of the country.